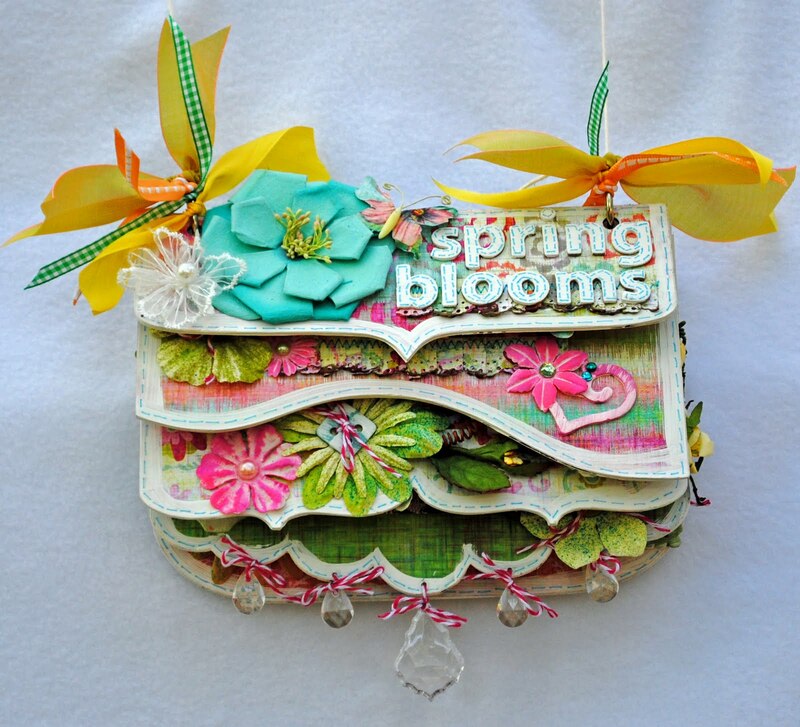 This little chipboard album was a delight to make. 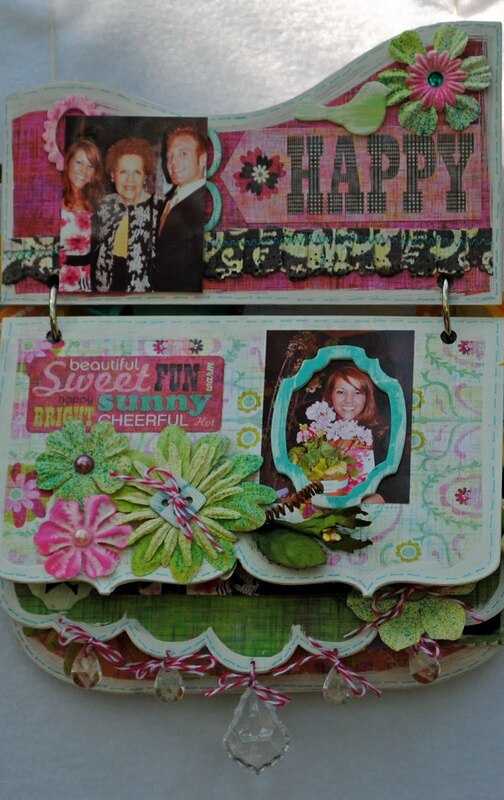 I loved using the little Heart of Texas chipboard album as the canvas for this mini album. After applying the gorgeous Basic Grey patterned paper , I used a flat white acrylic paint around the edges to give it a shabby chic look. Then, I used a marker to draw the stitches around each page. 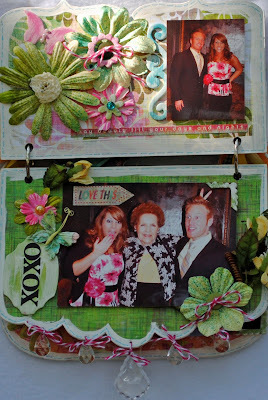 The lovely embellies from The Crafty Scrapper added such sweet touches and made a beautiful setting to show off the photos. 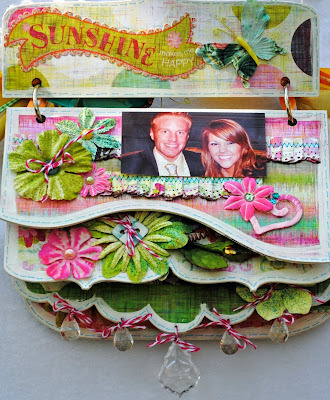 Stop by The Crafty Scrapper and see this sweet, sweet album for yourself! 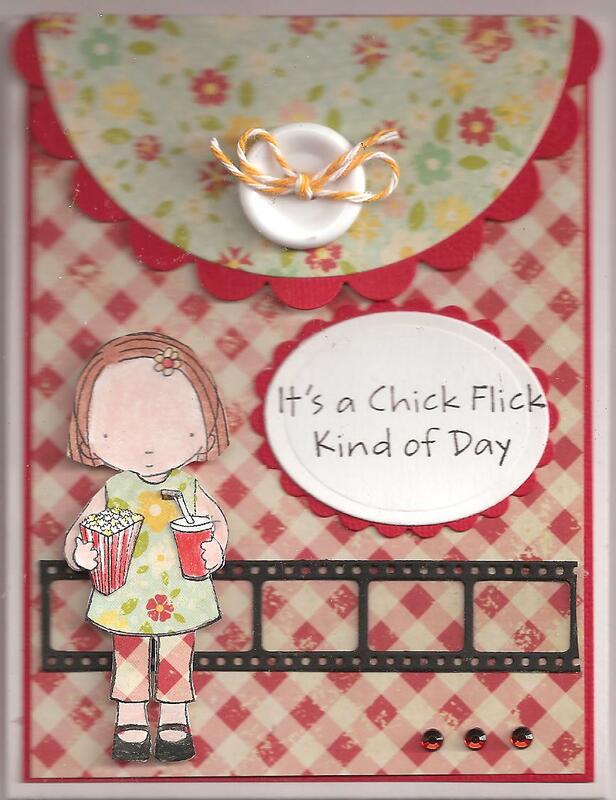 This LO uses Jillibean pattern paper, and lots of fun Maya Road shapes from the “Still Sew Cute Chipboard Set”. In the area around the picture I used Maya Road Maya Mists (Granny Smith Apple Green) and a Tattered Angels Glimmer Screen to create the oval frame before adding the picture. Also spritzed with the Maya Mist was the Mini Triangle Banner Canvas Pieces which are also by Maya Road. For the title, I used Maya Road (Jonathan) Mini Alphabet Chipboard and October Afternoon Mini Market Stickers over a Maya Road Coaster. The Martha Stewart Punch Around the Page “Loops” set gave an old fashioned look. 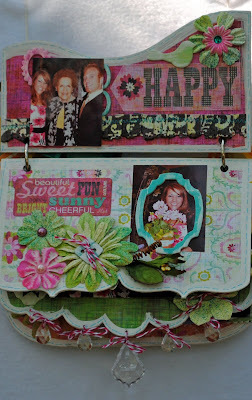 Also included was a little Jenni Bowlin Vintage Style (black) Button and a Maya Road Kraft Scroll Frame Journaling Tag. The chipboard pieces were painted with Ranger Ink Tim Holtz Distress Crackle Paint (Fired Brick). After the paint dried, I inked the edges of the chipboard pieces with Staz On Ink (Jet Black). Some of the techniques that I used were border punching, painting, masking, sewing, inking and a little calligraphy on the journaling tag. 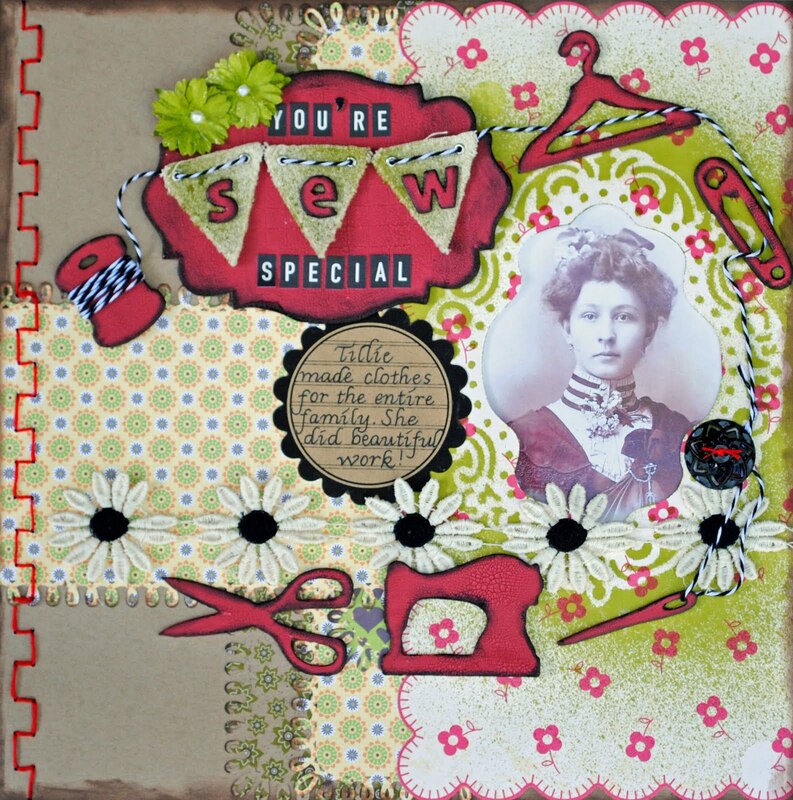 Layout created for The Crafty Scrapper Design Team by Patty Rogers. 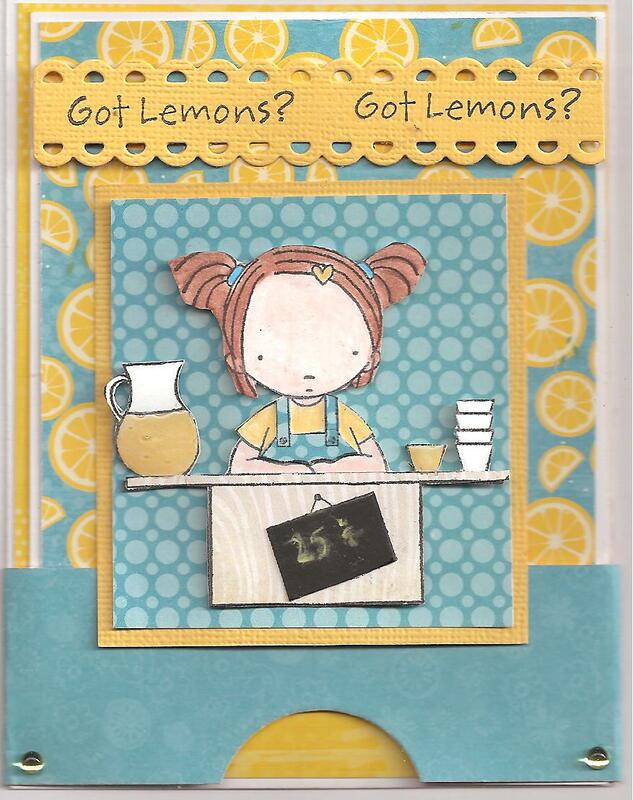 Tina will be teaching these adorable cards later this month at The Crafty Scrapper! Wed. July 27th 11:00 a.m. to 2:00 p.m. AND Sat. July 30th 2:00 p.m. to 5:00 pm. What do these items have in common? Well, they are the themes for three unique cards you will make in class using pretty papers, and stamps and dies from My Favorite Things. 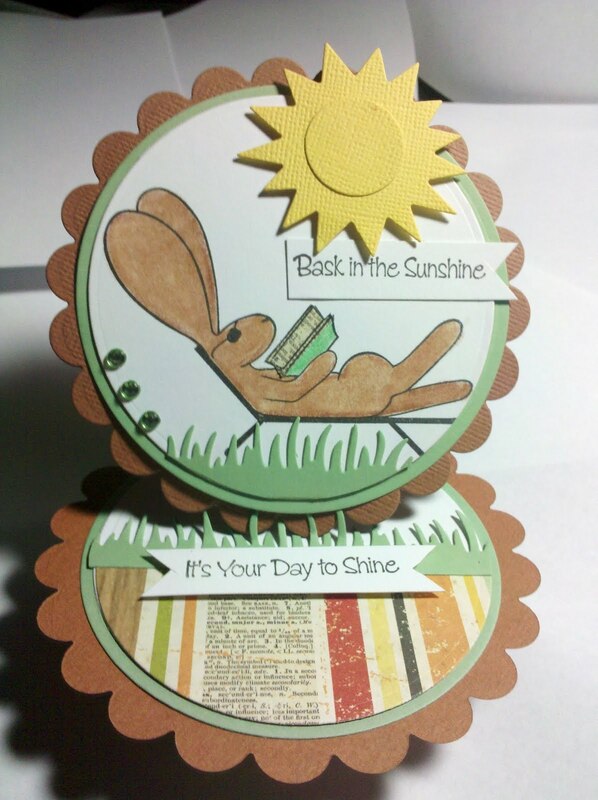 You will create a Sliding Pop Up Card, a Shaped Easel Card, and a Flap Card with a magnetic closure. All three look hard, but are simple to make! Please bring adhesive, small pop dots, Xyron X (if you have one), detailed scissors, and your preferred coloring medium (Copics, colored pencils, etc.) All other supplies provided. 10am ~ midnight 14hours cropping, pizza, salad bar, drinks and dessert. Save the date for this years breast cancer crop, your $75 goes to the Susan G. Komen Foundation. The crop will be Saturday September 17th. We have a lot of exciting things for this year, so look for the special email on this event in a couple of weeks and spread the word to your friends. Sign-ups will be Monday August 1st at 10am, please do not call to sign up before than. 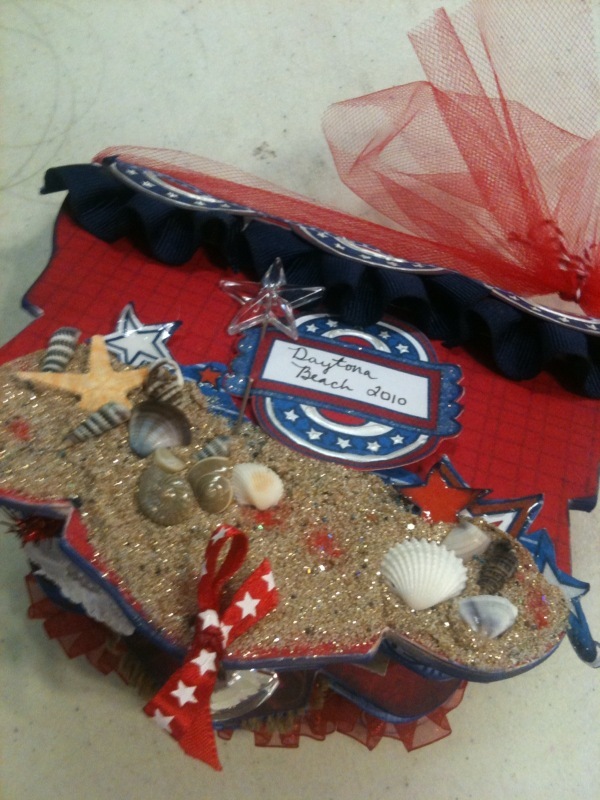 Come join us and make this colorful, fun, 4th of July book! This book is full of sparkly sand, sea shells and lots of techniques using Viva pearl pens and inka gold. Every page is full of goodies. Supplies; basic tools, pop dots, glossy accents, zig .05 black pen and chalk ink. Capture those summer memories and fill this adorable book. Using an antique number sign as a cover, this book is filled with fun embellishments you will be painting and altering and using zipper trim in new ways. Supplies needed; basic tool kit. It's finally here, the IHYBC class ! No not the BYOB..... It's the I have your bottles so come and get them class! I can't tell you all how much fun I had creating these bottles. In this class you will alter NINE vials and turn them into unique one of a kind pieces of jewelry all of your friends are going to want. 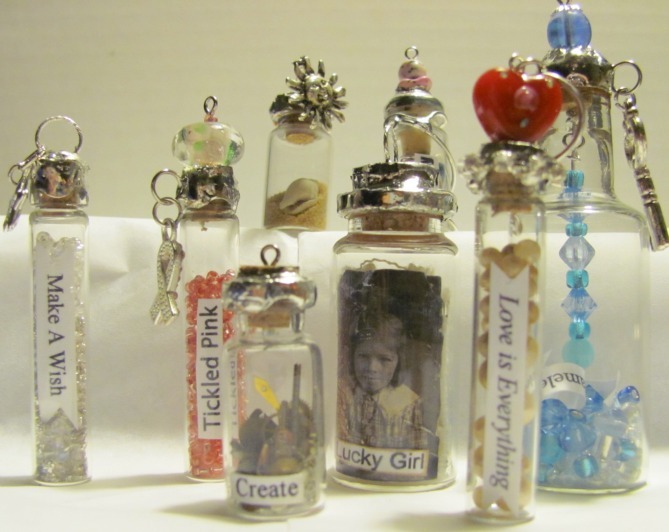 You will fill your bottles with all kinds of fun finds, learn how to solder rhinestones, wrap wire, and create dangles inside the bottles. We will then solder them closed, adding charms, and decorative jump rings. 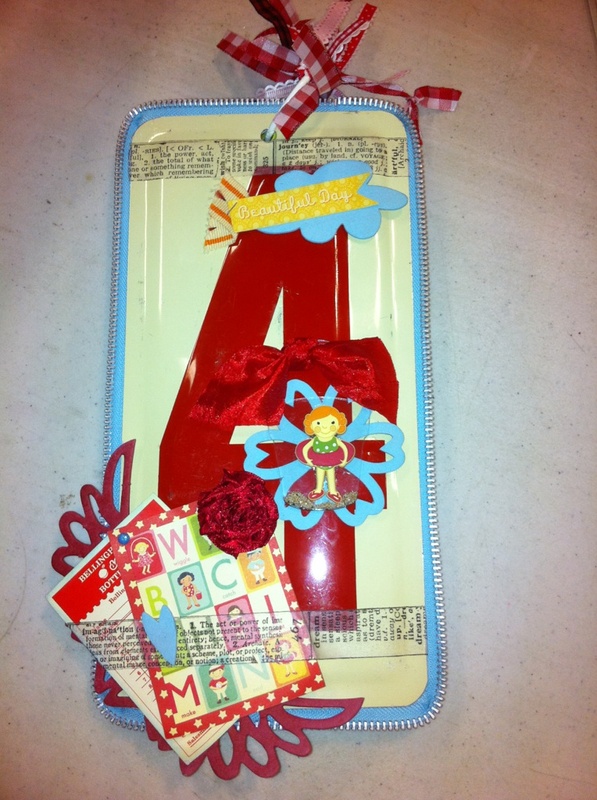 This will be a fun filled creative class sure to please the beginner to the novice. In this class we'll each transform a unique vintage cigar box into an aged and distressed work of art. We'll create depth and age with paints, mists, inks, texture mediums, metal accents, and patterned paper. 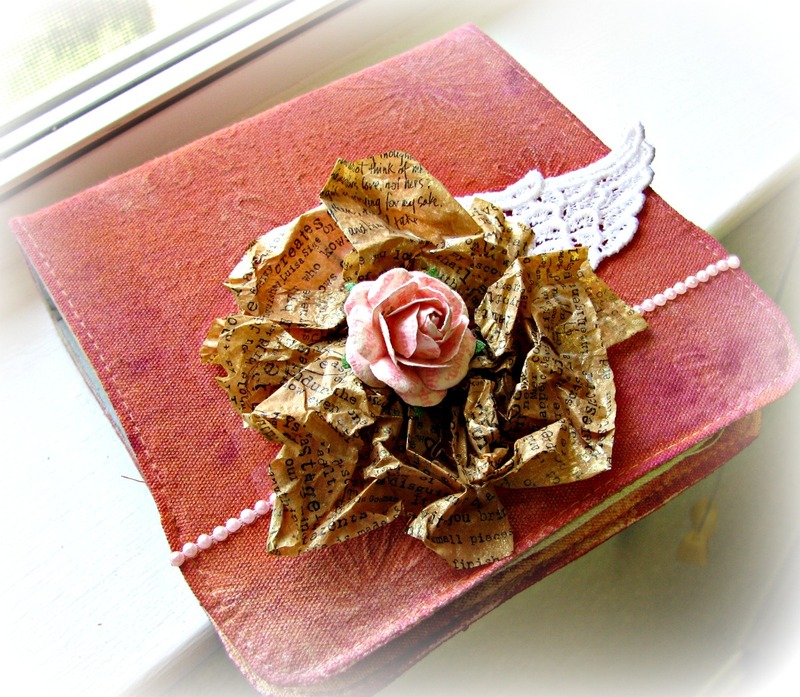 We will also create a vintage inspired mini-journal to fill the box. Have you always wanted to play with canvas but you were a little intimidated too? Have you always wondered "How did they do that?" When looking at a canvas mini album? Well fear no more and come and play in my Capturing Canvas class. You will learn not only how to get the most out of your canvas album but how to have fun and be creative in the process. I will show you how to use several types of mediums to achieve a magnificent mini album for you to cherish for ever. Come join me as we capture and conquer canvas together! Includes class and supplies, pizza, drinks, dessert and free crop time after lunch. Be sure and bring something to work on during your free time after lunch, the crop room has several die cut machines, punches and much more. 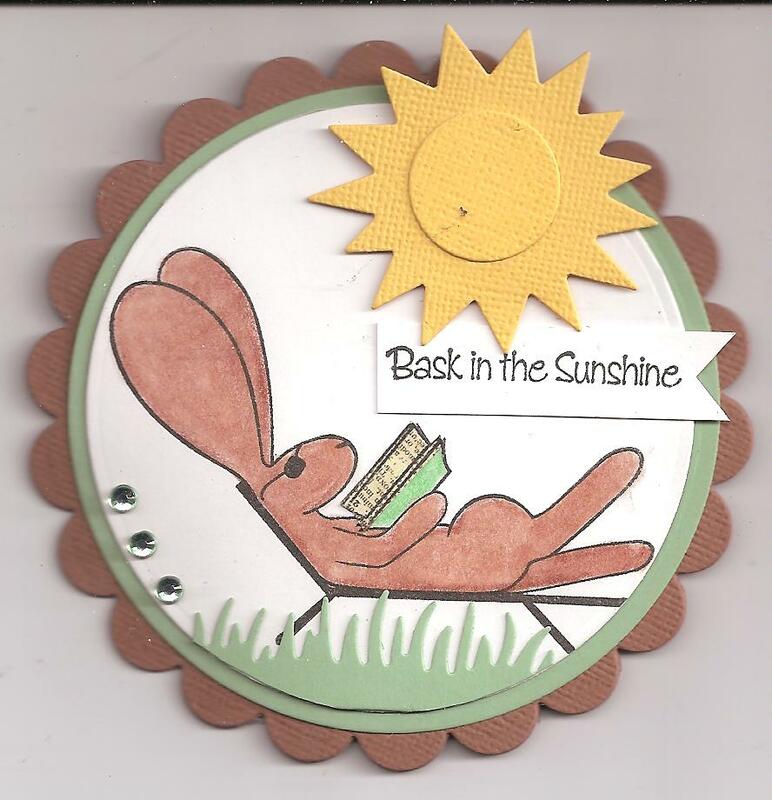 Come and join me in making this FUN summer album! You will be painting and working with the Maya Road chipboard album. You will need to bring basic kit (paper trimmer, adhesive, scissors). In this class you will be a painting and decorating your own personal “book” to keep all the special cards you make for friends and family! 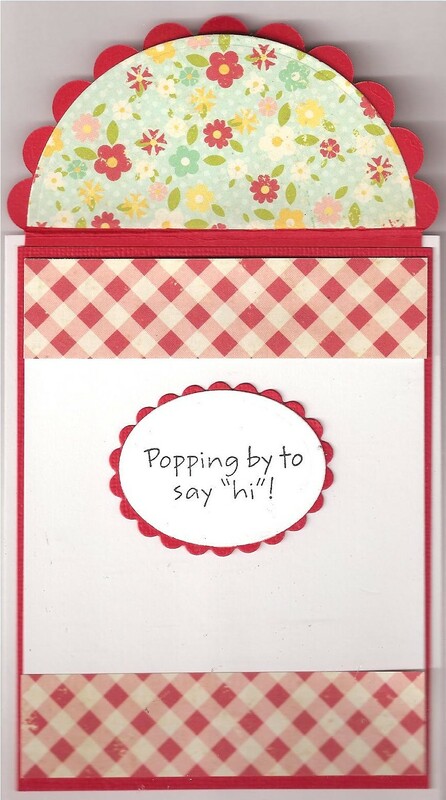 We will also be creating 2 cards… one that feature the new honeycomb paper. Check out these beautiful layouts by our guest designer Jennifer Babcock. 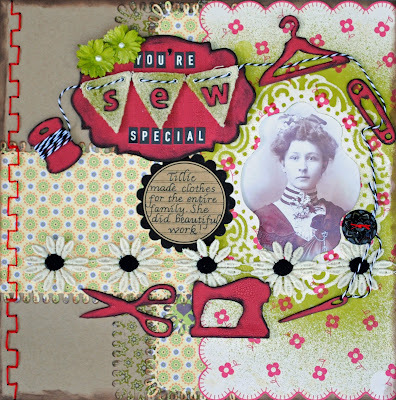 Our guest designer, Jennifer Babcock, brings a touch of vintage to The Crafty Scrapper. A sweet baby birthday card. Love her style. 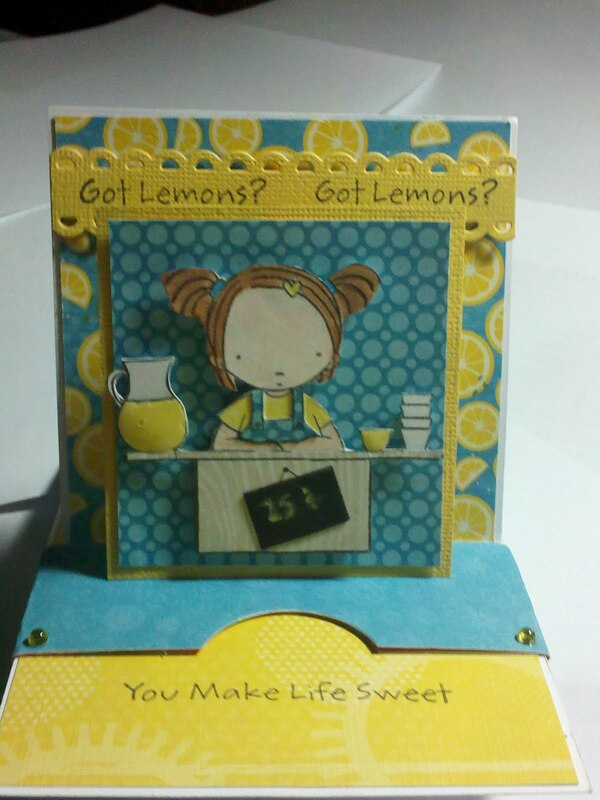 You can see more of her work at The Crafty Scrapper, and on her BLOG. Thanks for looking! I had lots of fun layering ribbons, flowers, photos, and embellishments.